Hitherto the party has assumes the existence of a scientific method, routinely applied in the natural sciences, producing results which stand as the exemplars of objective knowledge. In trying to answer the question heading above we have selected an example of this assumed method applied to a physical situation, than compared the results achieved with the application of party theory to the analysis of the capitalist system. The inference drawn is that socialist knowledge bears direct comparison with scientific knowledge. This whole approach poses problems because it seems impossible to make clear the nature of “scientific method” and it makes the validity of the socialist case dependent upon the truth of the current scientific orthodoxy chosen as the base for comparison. In an attempt to overcome these difficulties this bulletin will start from a different position and show that the desired conclusion can be better drawn after an inquiry into the nature of science has been done. But first we will consider a more traditional approach. Speaking loosely, when we say that socialism is scientific, we mean that our analysis of capitalism yields a picture of society which challenges the alternative pictures and contradicts them. The regularity with which capitalist throws up wars, crises, depressions, unemployment and other social problems is the standing evidence that these alternative analysis, which deny that one or all of these are features of this society, and unscientific. Socialism Utopian and Scientific by Engels develops this approach. For him socialism became scientific when it could give an adequate account of history and also mount a criticism of capitalist society. The foundation for this criticism was an understanding of the class struggle and the articulation of the process of exploitation; demonstrating that the solution to the workers problems lay not in any arbitrary reformist or Utopian schemes for social change but in a revolution which alters the foundation of social relations at, the source of the problems. Behind this analysis by Engels there was a commonsense attitude to physical science as the application of a species of philosophical materialism to empirical situations, yielding theories which are adequate to nature as an object. He was well aware of difficulties here and tried to tease out the “scientific method” from actual physical science in his notebooks called Dialectics of Nature; but he died before a series of major revolutions in the physical sciences showed that his ““cientific method” expressed as dialectics had produced a set of theories inadequate to nature – in terms of relativity, genetic and quantum theories. The use of dialectical theory to erect a bridge between Newtonian and Einstinian science is shown to be a failure. However, these is no reason why the attempt to establish a relationship between the science of socialism and physical science should be abandoned. Yet this is what the party has in fact done. For instance, at a recent education class on the origins of socialist theory, the intellectual, social and political origins of socialism were spelt out as German philosophy, French utopian socialism, and British political economy. All were woven together to produce scientific socialism. The rise and development of modern physical science was not see as one of socialism’s antecedents. Traditionally this discrepancy has been resolved by according to social theories a lesser place, pointing to the lack of agreement among social theorists and the impossibility of treating society as material for controlled experiments as the reasons why social theories cannot achieve the status of science. It is possible to go some way in arguing against this position in a piecemeal fashion and this the party has done .as follows. As our case depends upon conscious action and agreement on the part of the majority of the workers of the world, we look forward to a time when agreement will be reached in the world community, just as it is supposed to exist now in the scientific community. Furthermore, socialism, once achieved, can be looked upon as a world-wide social experiment to establish whether or not the social relations of the new society will work. If they do not, well, there will always be the ready-made system of capitalism to fall back upon and nothing will have been lost. Now whether you find this argument effective or not depends upon your ideas about how science operates. If, like Karl Popper, you are a fallibilist (someone who believes that scientists spend their time in laboratories making inspired conjectures and setting up experiments aimed at refuting them) then the socialist revolution for you can be considered as an attempt to refute the theory of the SPGB. If it does not do so and socialism is successfully established, who cares whether socialism is then called scientific? We will have achieved our aim and moved from the realm of theory to that of practice. The fallibilist argument above has been used by the party since before the first world war. It is a useful rhetorical device, but it commits us to the view that science operates as Popper says. Whereas the history of science, in episodes like the rise of non-Euclidean geometry, continental drift and quantum theories, suggests that science is carried out in quite a different fashion. On this other view the scientific community is split at times into warring factions, many members of which would sooner die than admit any of their opponents claims. The alternative to Popper is that of T.S.Kuhn, who points to the function of dogma in sciences which move from one tenaciously held exemplary theory and achievement, like that of Newton’s Principia, to another, like Einsteinian relativistic mechanics. Both of these exemplars did and do fuction as paradigms of knowledge and action, within which the normal science of piecemeal puzzle-solving can be carried out. Generations of astronomers tied to solve the puzzle of finding a Newtonian explanation for the orbital behaviour of Uranus, until another planetary influence was postulated and discovered in Neptune. Such normal science may be contrasted with the extraordinary science which goes on during periods of revolution; when no settled theory is available and most scientific research is concerned with large-scale questions on the foundations of the physical universe. Over the 200 years up to 1700 Copernicus, Galileo, Brahe and Newton all produced mutually exclusive world-systems, while the scientific community was in a ferment with the demise of the Ptolemaic system. For Kuhn science is conservative normally, but punctuated by periodic revolutions and the process is endless – science is not evolving towards a goal of truth. Just as on says that biological organisms did not evolve towards homo sapiens as a goal. All of which is in contrast to Popper, for whom science is always revolutionary – it approaches to truthlikeness or verisimilitude by continuously purging itself of falsity. When it does not, then it is bad science. The use of this style of argument to establish the scientific character of socialism becomes complicated here, because political positions are associated with those theories of science. Popper is an opponent of political revolution and a critic of Marx; if you flirt with Popper’s view of science your revolutionary intentions will be misunderstood. One way out of this difficulty is to use the strategy often employed when we put the case for socialism, dividing the subject into active and passive components. Here we get the opponent to agree that capitalism is as we say it is and the passive part of our case is granted the status of science in passing. The argument then goes on to the active part of our case; the claim that the workers can and should take up socialism and solve the problems of their class. An opponent of our party – the Walsby Society – has entered the fray recently at just the stage above; granting us our case against capitalism, but denying that there is any evidence for the workers ever being able either to understand our case or capitalism, or combine together as a class. What must be kept in mind here is that if you take science to be what the Walsby Society take it to be, then you cannot answer them; except with some argument about “capitalism creating its own grave-diggers”, which only delays the ends as capitalism has not yet created then and again, where is the evidence that it will? Nowhere, save in the example by analogy that feudal society created the merchants and burghers who dug its grave and built capitalism over it. To make this argument conclusive though we need to invoke a goal-directed or teleological view of historical evolution, with unseen forces driving the workers on. Yet the party stops short of making socialism appear inevitable – and so we have no answer. “The mode of production of material life determines the general chara cter of the social, political and spiritual processes of life. It is not the consciousness of men that determines their existence, but, on the contrary, their social existence determines their consciousness.” (Quoted in Historical Materialism, SPGB pamphlet, p.60). The party has extended this viewpoint in various ways, applying it to modern capitalism and has found that the general character of the political and spiritual processes of the peoples of the world has been conditioned into uniformity by the world-wide expansion of the capitalist system. Why then should we reserve a privileged place for science? Why exempt physical science, one of the cultural products which capitalism finds most useful, from this analysis? What else can science be but the creation of social actors in definite historical circumstances? To back this up there is no lack of material on the social nature of science some of which we will now relate. If the history of a scientific theory is traced back in time a point is soon reached when another contender was in the field. Take physics at the turn of this century and the opposition between Newtonian and Einsteinian. mechanics. The choice between these two was not made on the grounds that relativity worked and the other did not. Indeed, to adopt that view is to remain a Newtonian; for the trajectories of the moon and planet space shots of the last two decades were calculated using Newton’s celestial mechanics. Neither does the device of pleading that Newton’s laws are true to a good approximation remove this difficulty. A scientific theory is always more than a set of equations, it embodies a picture of the world; just as socialist theory embodies a picture of capitalism. Newtonian theory gives you a picture of a world where light travels in straight lines through an ether. Relativity theory gives you a picture of a world where light travels at a finite speed along geodesies or space lines in a vacuum. The first is not a good approximation to but a flat contradiction of, the second. Snivelling logicians, such as those in the Walsby Society, might try to object that Newtonian physics are but a special case of relativity, from which they can be derived. But this cannot be, as no scientific theory can be in conflict with its special case and, as we have seen, the two theories do conflict. For as the velocity of a Newtonian particle increases towards the relativistic effect at high energies, the definition of what was meant by a particle has to be changed to .Accommodate the idea of a particle as a wave of variable amplitude in space. At which point the two theories are both incommensurable and mutually exclusive. Here defenders of the conventional view of science have little choice but to assert that there is no science except the current orthodoxy. They must accept a creed which glorifies the science of now and, in a most unhistorical way, deny that anything can be learned from the past, for it is all error to them. Such ethnocentricity is the ideal philosophical vehicle for Labourites, Keynesians, Social Marketeers, Monetarists, Walsbyites – all the dog-ends which litter the ash-trays of knowledge. For when we use an historical argument against these people, they frequently reply that we are now living in a different world. Such a position might be reasonable if they also allowed that some theory other than their own was tenable when “capitalism was a different world”. But the ethnocentricity which goes with these views also requires that history be reconstructed according to their own orthodoxy. Thus, theorists like W.W.Rostow write histories of the last four centuries as if the major concern of all nations at all times has been the obsession, with growth of GNP, current since 1965, when the post-war boom began, to fade. The idea that there is only one form which knowledge can take in this or any other society sums up this epistemological imperialism. “A science which hesitates to forget its founders is lost”, said A.N.Whitehead the mathematician. Such historical forgetfulness is a necessary condition for a science which is held to be the sacred truth to which all classes can appeal. But, with each change of theory, when the last lot of founders are forgotten, it requires that the picture of the world as seen by the scientists must change. Yet each generation tries to project its theories as being consistent, coherent and complete – scientific. There follows the story of one of the best. Before Newton published his theory it was widely known that any inverse square law of gravity would founder on observations made when the planet Mercury was at its perihelion, or greatest point to the sun and wobbled in its orbit. The Newtonian theory could not explain such anomalies, yet for centuries it was accepted and few, before the mid-nineteenth century, suggested that the inverse square law of gravitation should be modified. The reasons are not far to seek. In the years before Newton’s time capitalism had been developing apace; the charter of the Royal Society, to which he belonged, explicitly formulated certain scientific and technical problems for which a solution was urgently required. The large-scale steam engine had just come into service in the mines and a theory of mechanics was essential if its operation was to be understood and refined. How urgent this was Cromwell had disclosed during the Civil War, when in one year he required. 335 new cannon, 1500 guns, 117,000 cannon balls and 5000 hand bombs. War on such a scale required scientific and. technical sophistication. Moreover the application of the empirical arts of war required rationalisation and a theory was needed which would draw together much of the discrete experimentation on ballistics of the recent past, so that efficient warfare might be waged against trading competitors. Likewise with the heavier machinery which was beginning to be used in the weaving industry; the mechanical properties of the wood and metal parts required elucidating if breakages were to be avoided. Add to these the problems of navigation in an era of expanding world trade and you have a set of social and economic roots which sustained interest in the development of the theories in Newton’s Principia. Observation and experience alone did not in this case determine the actions of the scientific community; the requirements of the nascent capitalist society must be added to them. Once Newtonian theory was taken up then solutions to other problems couId be tried out. An optics and a theory of light which was in harmony with the mechanics was attempted; a theory of electricity was developed; these gave useful aids for the development of a magnetic theory; and so on. All of this was part of the puzzle-solving process of normal science, undertaken by the scientific community once it has taken the step of espousing a major theory. The puzzles all seemed to be solved and a unified electro-magnetic theory was proclaimed in the mid-nineteenth century. The most that future generations of physicists seemed able to expect was the slow crawl to more exact decimal place determination of the known constants. But then the anomalies which had been around for some time began to appear damaging to the whole edifice of physics. There was controversy and a crisis in science. The dual evidence for wave and particle theories of light was a scandal. Progressively more accurate values for the finite speed of light were impossible to reconcile with its instantaneous velocity. When a fourth state of matter was proclaimed in x-rays, the scientific community was torn apart. One year after the SPGB was founded, so was special relativity. A scientific revolution was in full swing. A little earlier and before anybody had a substitute for Newtonian physics, Ernst Mach contemplated the results of research into anomalies like black-body radiation and the photo-electric effect and suggested desperate conclusions. Mach wanted to remove the materialist background, so that talk about science would no longer be talk about mass, length and energy, but about sensations, scale divisions, pointer-readings and so on. During this extraordinary period when science tottered, Lorentz came forward with a set of transformation equations which allowed some of the mathematics of electrical theory to be salvaged. Slowly a group of physicists began to develop theories which turned away from the Newtonian conceptions, among them Einstein, who had then published his paper on brownian motion. The first steps towards a new theory were made when the quantization of light was suggested and it was insisted that mass might not be conserved, but transformed into energy. This group of mavericks were tireless propagandists for their own ideas; showering the editors of journals with notes, circulating their results to other research laboratories prior to publication and pouring damnation upon the die-hard Newtonians who held the field. The old physics was not disproved, its practitioners merely died out, or had retired by the end of the first world war. It is important to note that this is not an attack upon science, but a restatement of the social conditions for rationality. All that we have described so far has been perfectly good science and so is what follows. The roots of the quantum revolution, triggered by the publication of the new quantum theory in 1926, can be traced back to political interests within German capitalism. The prestige of German science was never higher than during the years up to 1916, when German capitalism was challenging for mastery of the world’s trade and territory. The early victories of the war underlined this technical superiority. But it all collapsed with the Armistice, the Versailles Treaty and the imposition by the victors of the Weimar Republic. The investment of German capitalists in industry, science and research slumped, because they saw no way of using their capital which would bring in anything like wartime profits. So they went on a binge. For a short period the scientists were reviled by the population. Science and technology were blamed for the failure of the war effort, as they had been praised for its earlier success. With severe inflation and insurrection on the left and right, from the Spartacists and the early Nazi movementss the complete decay of Gorman culture became a talking point. A subject of conversation in the laboratories became Oswald Spengler’s book The Decline of the West, first published in 1918. In this work the cyclical nature of history was asserted; using evidence from a wide range of cultural fields Spengler forecast the complete decay of science, political life and the arts by the year 2000. Many German scientists agreed with. Spengler and said so in their lectures, but their interpretation of the decay of science was that the mechanistic and causal world picture, triumphant at the end of the nineteenth century, had to go. So it came about that the scientific community dropped what had been its main tenet for over 300 years and it did so before anything had arisen to take the place of causality. In an environment hostile to their science the heads of the Institutes, the professors and their researchers drew in their horns. They pleaded for a small living space which science might occupy and a little money for it to spend. No more did the physicists see their discipline as the study of precise effects arising from determinate material causes. They temporized in order to deflect the then current hostility from the totality of science to a small part of it which they were forced to abandon. They allowed that the fads of the capitalist class for spiritualism, astrology and so on, also had their place in the scheme of explanation. This genuflection to the partialities of a class society lubricated the passage to the new quantum theory of 1926 and the Heisenberg indeterminacy relations. Both of these conceptualised physical systems in non-causal terms and most of the scientists who developed, them either lived in Germany or were closely associated with the German research institutes. One might agree that scientists are sensitive to the cultural milieu, yet deny that social processes affect the actual content of scientific theories. However, consider the way that the theory of evolution was constructed. Far from being a mere fact collector on a grand scale Darwin was a synthesizer of social, political and economic theories. His cataloguing of species differentiation and their distribution did not constitute a conclusive argument for evolution, as even the most complete list of species could still be accommodated within the series of special creation theories and the fossils explained by successive floods. What he needed was a plausible mechanism for the process of evolution. He found it, or something like it in the Malthusian population theory, allied with Spencerian notions on the survival of the fittest. By analogy with increasing numbers of people leading to war, famine and pestilence, growth in a plant population leads to increasing competition for light and nutrients in the soil; hence those plants which were tallest, or had the broadest leaves or deepest roots survived and perpetuated their races in such a struggle. On the assumption that nature had infinite variety, plants more adapted to succeed in the struggle would evolve and differentiation into species on the part of the fittest could be accomplished in a few generations. Still an actual physical mechanism for evolution eluded Darwin, so, again, he resorted to metaphorical description, drawing upon the resources of Victorian capitalism. Darwin’s basic metaphor was that nature selects for survival certain races, just as the commercial plant breeder does in his nursery, or just as the domestic animal breeder does on his farm. Selected inheritance is the source of variation in nature, said Darwin, because animal breeders would smile at any contrary opinion and hard cash paid on the nail for improved livestock is an excellent test of inherited superiority. Thus it was not the facts of nature, but an appeal to profitability or commercial success which was the final resource for Darwinian, evolution. It might be said that evolutionary theory took the form which it did because of ignorance of genetics at the time. Yet if one generalizes the point that science is constructed from cultural material drawn from the wider society, then it can be seen to apply elsewhere. For if science at the research front in any period is considered, then, the scientists are always constructing their theories in ignorance of future developments. What else can they do at the time, other than select from the cultural materials to hand, under pressure of the social influences operating upon them? Deep down in a disused mine in the USA there is an enormous tank of dry-cleaning fluid, designed to catch that elusive sub-atomic particle – the neutrino. After the theoretical physicists first postulated the existence of this unstoppable particle, the astrophysicists specified the neutrino’s rate of production in reactions within the sun. Divide the “window” presented in the tank of dry-cleaning fluid by the total surface area irradiated by the sun at the Earth’s orbit and you get that proportion of the “solar neutrino flux” which should be caught by the tank. Before the experiment was started the predicted solar neutrino events (SNU’s) meant that the signal would be right down at the background noise level. Collaboration between the would-be experimenter and a theorist produced a new prediction ten times higher than this; on the basis of which 600,000 dollars in funds were made available for a detection experiment. The tank, with its thousands of gallons of dry-cleaning fluid, was installed; the experiment went ahead. But the SNU’s observed were below even the original “noisy” prediction and successive experiments put them even lower. As a. result of which the theoreticians recalculated the “flux” several times and down it came towards the experimental value. Yet the gap remained unbridgeable by a factor of four. Controversy reigns in this field with each section of the physical community blaming the other – at least in public. A new series of experiments will require funds of three million dollars and if the money is not forthcoming, then the accepted level of the solar neutrino flux will be that which has been negotiated between, the experimenters, the theorists and the funding agencies. Truly, science is socially constructed. This has been part of the alternative account of science mentioned above. It is compatible with the socialist analysis of capitalism and makes it possible to describe the active part of the party’s case – that the workers may combine to introduce a new social order – as scientific. Indeed, given that the unconscious use of the mechanisms for social and political revolution predate the existence of modern science, it is more accurate to describe science as being socialistic, in the way it is achieved. The parallel between science and the way the SPGB sees the achievement of socialism should be clear. Scientists, like socialists, have to proselytize their ideas; because support for their theories comes as a result of persuasion and argument. They have to form themselves into groups, share knowledge at conferences and map out areas for new research. Conflict within the scientific community and the experimental anomalies generate a crisis, which can only be resolved by a revolution in ideas. The which applies to capitalist society, where problems such as unemployment and anomalies like starvation amid plenty can only be resolved by a political revolution. The organized, instrumental working class must, like the revolutionary scientists, have a clear idea of their identity and form a party if they are to succeed. Just as science is cultivated in social surroundings, amid a network of conflicting interests, so too is the case of the SPGB. Socialism would be a class solution to the social problems of today. A solution which would be in the interest of the majority class of workers, but not of the capitalist class. There is no objective, logical or rational ground upon which the capitalist and worker can meet and settle the matter. So when the SPGB advocates class war, this is not cause for despair, but for hope; that the pattern of social and scientific development of the past may be continued – not by an elite of scientists, not by a gang of political butchers, but by the ordinary workers of the world. 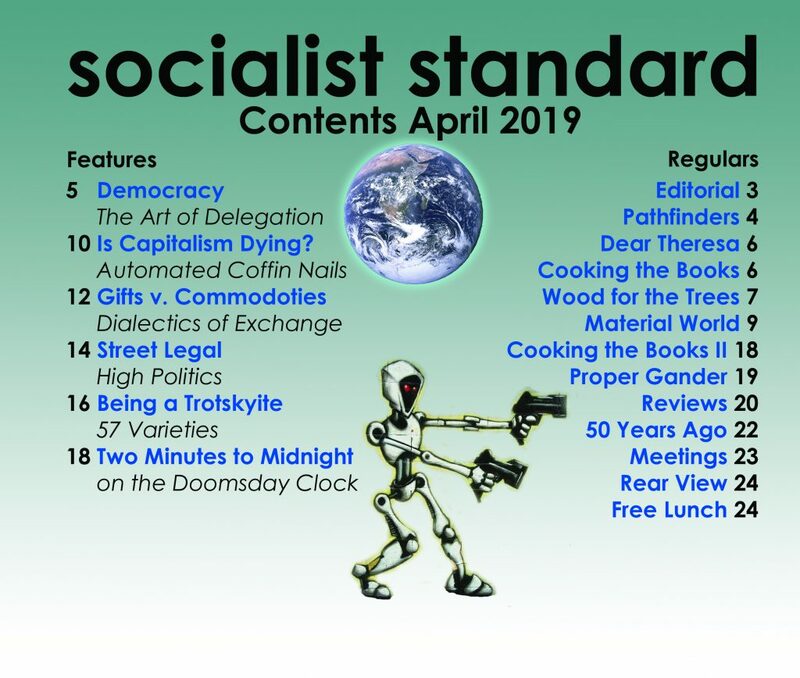 Does this conception of science allow us to demarcate between the socialism of the SPGB and the political alternatives? Yes it does and in a clearer way than the older conception of science put forward by Engels. His idea of socialism as science was designed to exclude the socialism of Fourier and Saint-Simon. These were theorists who appealed to kings and princes to enact their Utopias; thinkers who imagined that a cosmological revolution would herald their new worlds, in which the seas would turn to lemonade and cigarettes would grow on trees. These old opponents of Engels are no longer in the field. What we have to contend with are Leninists, Trotskyists, Labourites and their counterparts on the right. The professed policies of Labour and other social democratic parties are that by piecemeal social engineering, with the cumulative effects of reforms, the anomalies of capitalism can. be made to disappear. Such a policy supposes that the only effective actors for the solution of anomalies are governments and the agents of the state. It also supposes that everyone perceives anomalies in the same way; whereas in fact the maintenance of mountains of beef and so on in Europe, is just seen as good business policy by the European, agricultural and marketing capitalist class. In short, the labourite policy does not take into account the divided nature of the social community of capitalism. It is not modelled upon scientific practice, wherein the resolution of anomalies only occurs as the divided scientific community sinks its divisions and the negotiated experimental reality collapses into a consensus of agreement. Leninism takes as its basis the fomentation of insurrection on the part of the civil population, giving an opportunity for the taking of power by a minority; who then use that power to create a socialist society against the wishes of an opposing majority. This would be paralleled in the scientific community if a group of non-scientists seized control of the scientific societies, the publishing journals and the research laboratories, during a period of crisis within science. Using the power base so established to bring the members of the scientific community round to a new way of resolving the anomalies Attempts to engineer science in this way would fail, because the system of refereeing papers, of allocating prestige to researchers and so on, would appear arbitrary when the control of these institutional matters was divorced from the differing cognitive bases of understanding spread throughout the community. This is almost a redundant point as the Leninist strategy has obviously failed. Russia is no nearer to “full communism” than the USA. The production quotas and priorities decided in the successive plans seem arbitrary to the population who have to work to them. Resulting in absenteeism, dissidence, exile, prison camps and other familiar Russian phenomena. In that Trotskyism is based upon Leninism the same criticisms apply to it. In addition Trotskyists consider Russia to be a failed workers state. The analogy between such a state and science would be that scientists should seize control and run the scientific and industrial aspects of society from top to bottom: that they should institute a technocracy. But the scientists, like the workers, are divided in their social vision and perception of interests. Dockers strike against container loaders and private sector steel workers dispute with those employed in public corporations; just as nuclear physicists dispute with ecologists. The idea that science should function as a pure corporate enterprise divorced from the influence of the wider society is simply part of the rhetoric or ideology of science which grew up in the nineteenth century. That workers in Russia do or did feel solidarity right across their class is a similar ideology. They never did, save in a transitory opposition to tsarism and involvement in the first world war. The scientific state, like any workers state, would have to engage itself in the business of the wider world and that world would shape the knowledge and action, of the community. The denial that this is so is like the use of the language of justification, typical of scientists when they wish to claim that their knowledge is universal, objective and not socially bounded. As we have seen, this rhetorical claim bears no relationship to science as practised. The same may be said of the Trotskyist ideology. What of the conservative or non-radical alternatives to the SPGB? Can these be demonstrated to be unscientific? The essence of conservative thinking is that a social revolution is neither desirable nor possible. They say that the established social interests, investments in production and entrenched national spheres of interest are so central to continued social life, that no drastic rearrangement will ever be possible. A scientific parallel to this can be found in that model which views science as a system for the gaining of credit by its members. In 1905 Einstein was a no-account scientist working in a patent office; having zero credibility he could risk all by challenging orthodoxy. Such a possibility may no longer obtain, for the institutionalisation of science has become nearly complete. Huge research laboratories are run by elite Nobel prize-winners, who have accumulated massive credits in the form of original research and published papers. The complexity of modern science is such that only those with access to phenomenally expensive equipment, like particle accelerators, can contribute to knowledge in many fields. Yet to gain access to this equipment requires a measure of scientific credit, gained only by the acceptance of orthodox views enshrined in the wisdom of those who manage these laboratories. Current scientific thinking might then be self-perpetuating and the time of revolution may be past. On which analogy we have to conclude that the conservative political position cannot be shown to be unscientific. Capitalism might go on stumbling from one crises to the next, indefinitely, or until the atom rockets rain down. Still, that remains a contingent matter – something to be decided in practice. It will be interesting to see whether the future brings any revolutions in major scientific theories; for if the scientific community can break free from its own entrenched interests, then this will lend support to the idea that the social community can do the same. There is a long-standing row in some left-wing circles, which takes science as described above, in such matters as genetic population control (eugenics), IQ testing and the like; considering that science should be purged of these excrescences or abuses, leaving a pure residue of truth. The aim of such a. programme is the construction of a science which would be in harmony with a future socialist society. This hardly seems possible. For if you take away the influence of capitalist society then, until socialism is created, that new science would need to be created in a vacuum. While we might agree that socialists, to some extent, can create personal relationships which escape the boundaries, scientific or otherwise, of this society; we cannot see the effectiveness of trying to convert the scientific community to the radical science position. For even were this to be done, they would still remain unsocialist. 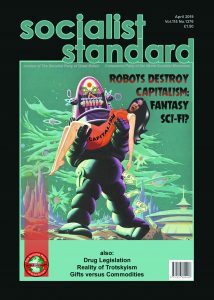 Worse still, the radical science position assumes that a science could exist in the form of a perfect objective knowledge; which was the common sense assumption of the first part of this bulletin from which we were unable to prove that the V/alsby Society argument against socialism was wrong. So with this we have come full circle. The Education Committee apologizes for the technical nature and length of this bulletin, but science is that sort of subject. We do not offer this as the last word on the matter, but as the foundation for branch discussions. A review of the technical matters discussed here is to be found in M.J.Mulkay, Science and. the Sociology of Knowledge, Allen & Unwin, 1979. First published in 1962 the original social assessment of science is T.S.Kuhn, The Structure of Scientific Revolutions, Chicago U.P., b1970. SPGB, Historical Materialism, pamphlet, 1975. Walsby Society, Unscientific Socialists, Roneoed, parts 1 & 2, 1979. I. Lakatos & A.Musgrave, Criticism and the Growth of Knowledge, (eds) CUP 1970. B.Hessen, in N.I.Bukharin et al (eds) Science at the Crossroads, 1931. R.M.Young, Darwin’s Metaphor: does Nature Select? vol 55, pp. 4421-503.The Monist. P.Forman, Weimar Culture, Causality and Quantum Theory, in, Historical Studies in the Physical Sciences, No.3, 1971. T.J.Pinch, Unpublished Papers, University of Bath, 1977-80. F.Engels, Socialism Utopian and Scientific,(in) Marx & Engels, Selected Works, vol 3, pp.95-151. Progress, 1973. F.Engels, Dialectics of Nature, Progress, 1974. Some statements of the radical science position are to be found in H.Rose & S.Rose, The Political Economy of Science, Macmillan, 1976. Hitherto the party has assumed that the solidity of scientific knowledge stemmed from the adequacy with which it reflected the world. How different is that from the view of this bulletin, that society and its social mechanisms supply the solidity to knowledge? A relativistic stance is made consistent if it is reflexive, that is, if it can give an account of its own genesis as well as that of knowledge in general. Has the SPGB given an adequate account of scientific knowledge in the past? In that none of this makes any material alteration to the party’s case necessary, is it of any relevance to socialists? Are your answers to the last two questions inconsistent? Given that science is as stated here, would it be best if we dropped the claim that socialism is scientific? Historical materialism was a component in this account of science. Can the labour theory of value also be incorporated?